A wonderful alternative to “H” wire stands, these plastic sign stakes are made from high density plastic, reinforced with fiberglass and manufactured with a minimum of 90% recycled materials. These stakes are designed to flex under wind load. Plastic Stakes have a simple, arched design incorporating a step for ease of installation. These plastic sign stands won’t rust, have no sharp edges and don’t have any oil which can be found on H wires. 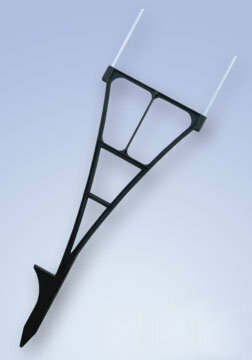 Plastic stakes are a “green” alternative to conventional steel wire stakes. They have less weight than steel and therefore and cost less to ship. Available in black only. Minimum order is 50 stakes and shipped in multiples of 50 or 150. These Plastic Sign Stakes are re-usable again and again. Recommend for reoccurring or longer term use. They are considered to be of a higher quality than the wire stand counter part. For example, they will withstand wind much better. They will bend slightly with the wind and bounce back. They are 24 inches tall and 10.5 inches wide. Our low prices on wire sign stands along with cheap prices on yard signs makes Heritage Advertising the cheapest to buy around. Unlike the competition, we will sell the wires separately and with the ability to ship these from 20 locations including east and west coast, we can provide lower prices than the competition. For smaller signs like 18×24 and 12×24, the 6 x 24 are the most popular and work great. They look like a “H”. Due to tariffs and volatility on aluminum and steel our cost to buy steel has gone up. We are as surprised as you and are very sorry for the inconvenience. Note the sign industry is moving towards using shorter wire stands. The shorter wire stands cost less due to less steel, and shipping charges are also significantly less. 6 x 24 are the most popular choice. We still stock the popular standard 10 x 30 wire stands. Also beware of cheaper made wire stands from China. They are cheap in price and in quality. The break at the wells very easily. Before ordering wire stands from any one, ask where they are make and save yourself grief by avoiding the China made wire stands.